Read Julian Ledger's "Welcome to Rogaining - 2014 style". He gives us his thoughts on this event and the February Metrogaine. Add your comments to the article. If you do not wish to have your name appear in results published on this web site, write to Anita Bickle. 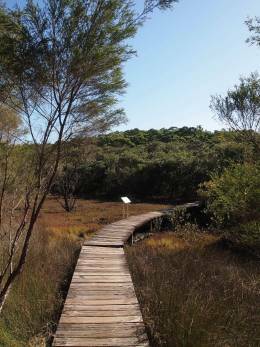 The 3-hour Minigaine took in the serene urban bush and wetlands along the Great North Walk from Boronia Park to North Ryde. The course featured a mix of mangrove boardwalks, dry eucalyptus forest and suburban parks and streets. This was again an on-track course. The start and finish was at Ryde Secondary College, 5 Malvina Street Ryde. Steve Ryan and Jeremy Fowler set a great course with lots of route options for everyone including plenty of shops, taps and toilets along the way. The A3 orienteering style map of the area was a nicely detailed 1:10,000 scale. The 1st Boronia Scout Group were at the event to run the BBQ. This event offered a "Concession" rate. It included ..